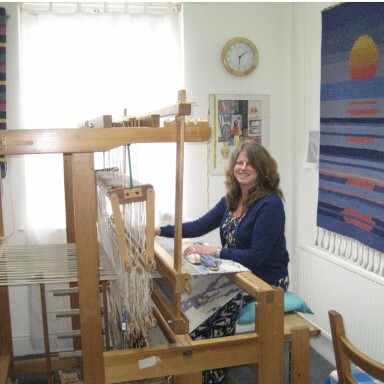 Jacqueline specialises in making individually designed handwoven rugs and wall panels for commission and exhibition. She uses a variety of traditional rug weaving and custom dyeing techniques to create a product which is decorative and functional. Each rug / wall hanging is made with a linen warp (threads running vertically) and wool or cotton weft (threads running horizontally). I employ a variety of traditional rug weaving techniques including plain weave, twill, and 3 end blockweave with shaft-switching, (a technique invented by Peter Collingwood). Many of the designs are reversible, effectively giving two different surface designs. My work is in public and private collections in the UK and USA. Major public commissions include weaving for Westminster Abbey, York Minster and Blackburn Cathedral. I undertake commissioned work from interior designers, architects, design consultants, churches, commercial and private clients.